They say a picture paints a thousand words. 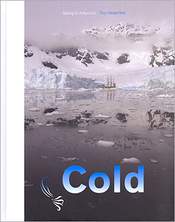 Well here in this self published book titled “Cold - Sailing to Antarctica” by Thijs Heslenfeld every picture paints an incredible picture that records a fascinating journey by the author to the Antarctica. Thijs chose to travel by the Dutch barque Europa rather than a typical cruise ship and every step of the journey is visualised with brilliant photography. The book has few words - it really doesn't need them. What we are treated with is a collection of shots that show life and death, pleasure and pain, beauty and the beast. We see terrific action on board the ship, superb baron landscapes, wildlife. The photography is technical perfect, the images are stunning. I've seen many decent penguin or ice-scape pics of Antarctica and wondered what it would be like to visit. Here I'm memorised and now have an urge to explore. The book is really well designed, production values are high and there's a novel half width Captains log mixed among the pages so as not to distract, but to provide a diary to the expedition. We liked this book so much we've arranged an interview with Thijs to find out more. Even if you have no desire to go to the edges of the world, or normally don't get enthused about travel books, here's one that will probably make a difference. Highly recommended.